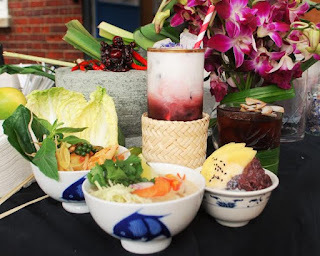 This April Seb Holmes' Farang London and Bold Spirits will be taking over The Lodge in Clapham on Monday nights, starting 11th, for some evenings of Thai food and cocktails (what could be better?). Dishes will include, Fried Seabass, Sour Fruits and Green Nham Yum, cocktails will include Toasted coconut Negroni, and save some room for dessert, because it's Fresh Doughnuts, Kaffir Lime & Apple Jam with Coconut Pandan Custard. I feel particularly pleased to list this one, as it was me who introduced Seb to The Lodge and got the ball rolling. Let's hope for lots more pop-ups at The Lodge on Mondays! "Farang London and Bold Spirits are collaborating to bring Londoners Thai sharing plates and cocktails two minutes walk from Clapham North underground station. Seb Holmes from Farang London (www.faranglondon.co.uk) and Tomas Lenko from Bold Spirits (http://www.boldspiritslondon.com) have been working alongside each other for the last few months at Brook Green Market in Shepherds Bush and love each other's products so much they have decided to link them up for a limited time only so please come and have a bite."